Well it's done, and I managed to get the tenants moved in and they are happy! 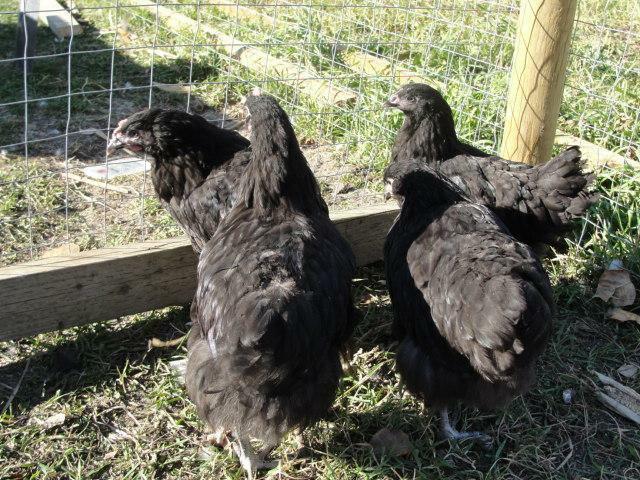 With my latest additions of a quad of Black Orpingtons and my New Silver Laced Wyandottes I had decided to make them a brand new Coop all their own. 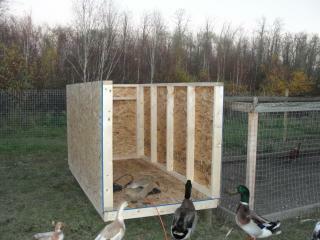 Working with a very small budget but going new on all materials I decided to make a 4x8 coop tall enough that I can stand up in it if need be allowing more than enough room for the 6 new occupants, and a possible two more down the road. 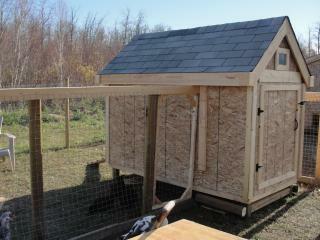 I designed my coop using Google Sketchup, which made things a great deal easier to visualize. 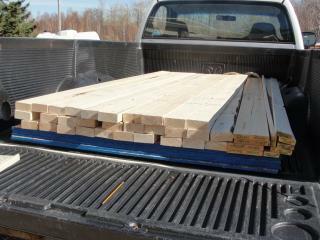 I never really looked at the plans after I bought the lumber, it was in my head after that. Now I guess I should mention that I live in the cold northern climate of Canada in the wonderful province of Alberta. We get some really cold winters here, and even though things can get to -50*C (-58*F) which is VERY rare.... 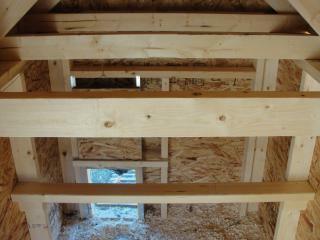 I have decided to post pone insulating the coop for now. Google Sketchup makes things easier when it comes to putting everything into perspective and trying to get an idea on materials needed. 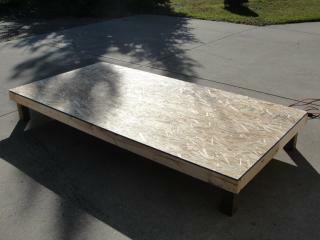 Numerous hinges, screws, nails and staples. 1 brass grommet for outer wall. a few metal clamps for looping cable. metal flashing used as a guide for pop door. Soooo If you have gotten to this point and have all your materials infront of you all you need to do now is plan where you want to build your coop. I highly suggest that you prefab the floor and walls on a level surface, and then move them to where the coop will be built, things are light at this point. 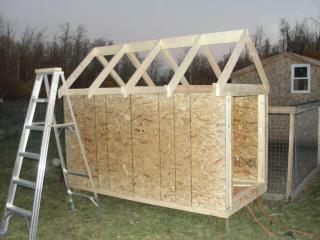 Follow along below with some pictures of how I built this coop all by myself. 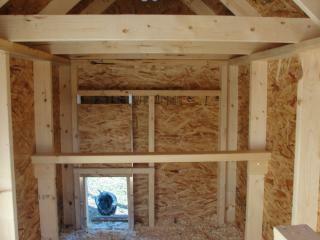 Here are some pics and some explanations of just how I put this custom coop together. 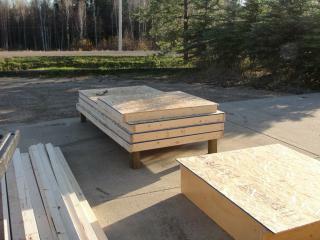 Prefab on the Driveway made things quick and easy. 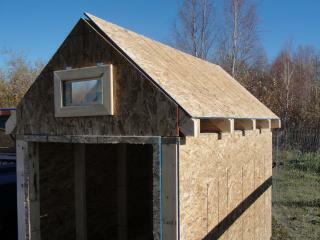 Construction of the Roof, framed, Sheathed and Shingled. 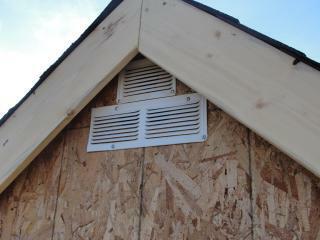 Also added a a window that act as an extra vent in summer and allows some light as well. The Door is on... Hmm what is missing?? 16% layer crumble mixed with 2 cups wheat and 1 cup cracked corn. 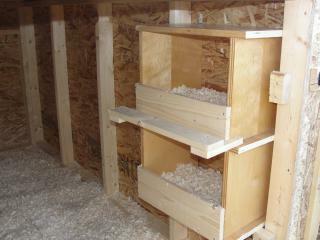 Here are the nest boxes, used from a recycled cubby shelf I got free from a fellow chicken enthusiast's child's kindergarden under renovation. The pop door, right now it is manual and operated by a simple wire loop system I set up. 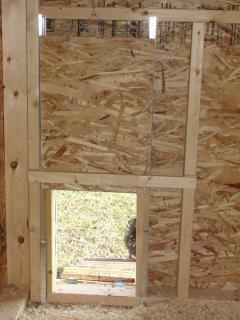 With the finger loop to operate the door located at the front of the coop. Sits between metal flashing as a guide, to prevent jamming. 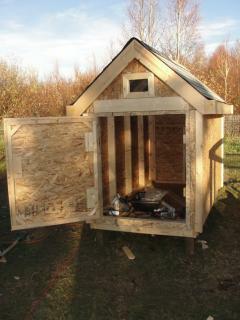 A final look at the Coop all completed with run....or is it??? 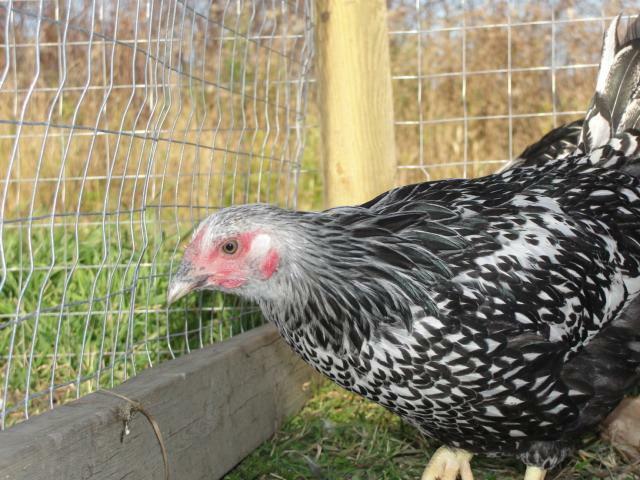 My pullet about 3.5 months old in this pic. My SLW Roo, 3.5 month old in this pic. 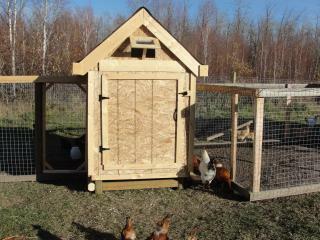 I hope that I have inspired you to be creative and build your own custom coop as well. NixSix, IshyBabe and tmwhitm like this. Thank you for sharing the details of your build and the materials you used to do the build. Very detailed and good pictures. Nicely done and full of detail. Links are no longer functional, but one can get the general info from the narrative and pictures. and love the pics of the occupants. "Very nice coop and article!" I appreciate the level of detail in your article. Your coop is really nice too. It has a good amount of space and good ventilation. 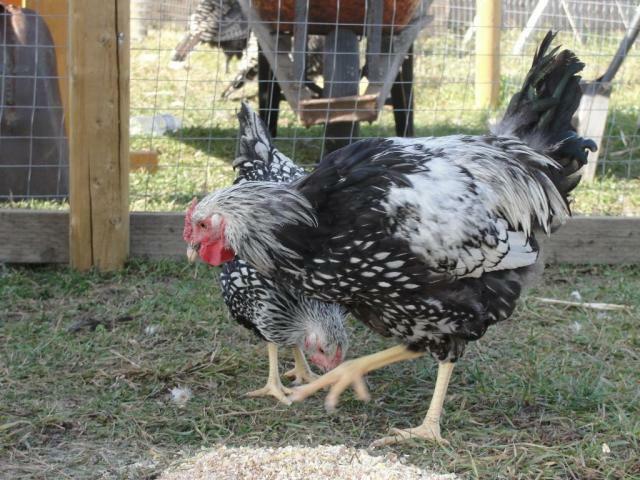 Might try this for our next coop when we get our own chickens. If I missed it I apologize, but does the material list include materials to make the run as well? If not, would you mind telling me what you used to make your run with and what size it is? 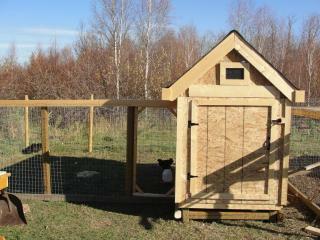 I'm really considering attempting to build this coop for my future girls! Well this coop has served me rather well for the last few years. 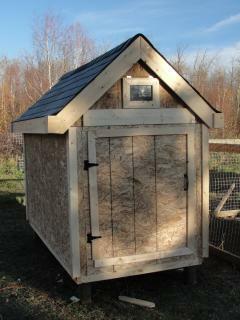 And I am happy to say that even though I never did insulate this coop. It worked very well. 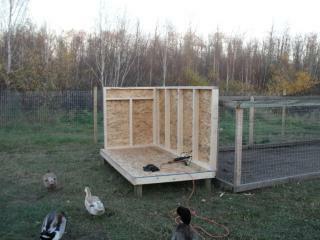 But times have changed and things are improving, So this coop must go to make room for a new one! 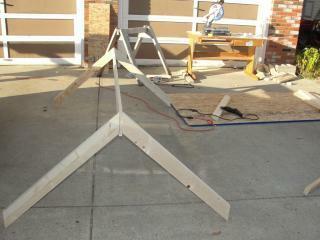 Could you post the link to the videos on how you made the feeders? 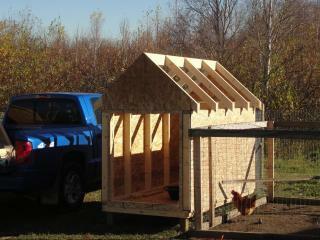 Great looking chicken coop. So, Johnny, I have to ask. Why no insulation?